VISIT US ON FACEBOOK FOR MORE TIPS AND COLORFUL PICS! LIKE US ON FACEBOOK FOR IMMEDIATE DISCOUNTS! Time flies so don’t let your plans for creating a happier space become only wishful thinking. You know you’re tired of looking at that aging discolored paint. You know you want to add some pizzazz to your life and a splash of color to those dreary walls! Let Church & Sons Painting bring our love, passion, and paint brushes into your home. 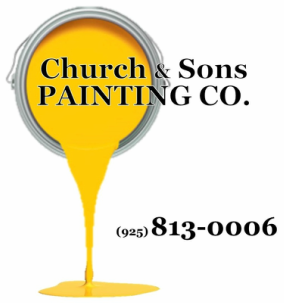 Church & Sons Painting Co. will make your castle look fresh, new and amazing by adding colo﻿r﻿ to your life! Tell us about your painting project or call us at (925) 813-0006! Feel free to leave us your phone number and the best time to contact you in the section below and we'll get back to you with your free estimate! Please provide as much information as possible such as the type of room you would like painted (kitchen, bedroom, bath, etc.). How high is the ceiling in the space you'd like painted? And can you provide an estimate of square footage? Submit for your free quote!